The island of Grand Bahama has a coral reef which surrounds it. 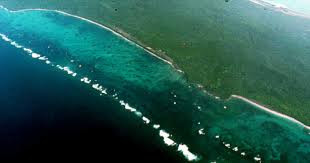 The reef slows the waves down and serves to protect the island's beaches and shoreline. 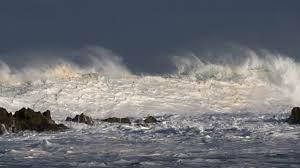 As the waves roll in---they hit the reef and crash--sending up huge sprays, but slowing the velocity of the water to a delightful gentle swell which rolls into the beautiful beaches. The water on the inside of the reef is the most beautiful shade of blue--caused by the refraction of the light when bouncing off the white sand bottom in the shallow water. 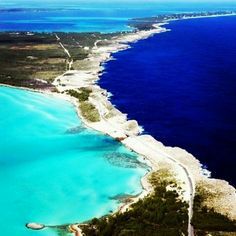 So on one side of the reef you have the dangerous deep-cold water of midnight blue and on the other the shallow-warm aqua waters the Caribbean is famous for. 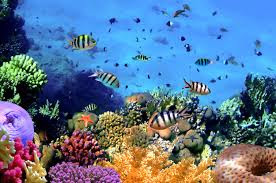 Without the protection of the coral reef, there would be no shallow-gentle water to enjoy. I have a propensity to surround myself with a protective barrier. I place an invisible fence around my heart in an effort to keep the dangerous emotional currents from causing damage and pain. I have a tendency to stay in the shallow calm waters of the known instead of venturing into the seemingly dangerous depths of the unknown. Basically---I like being able to see the bottom and staying close to my comfort zone. I have discovered some of the greatest beauty though lies in the depths of the deepest and most dangerous waters. Unless I am willing to take a risk and swim to the other side of the reef---I will never be able to enjoy this truly remarkable wonder. It certainly comes with a risk and there are no guarantees of not incurring danger --but the sight you behold is well worth the risk. As I ventured into the deep water on the other side of the reef, I was reminded of the need to venture into the deep emotional waters of life. I might be missing the biggest thrill by staying entrenched in my comfort zone behind the protective barriers I tend to hide behind. The biggest blessings may be just beyond the barrier--if I only trust my Savior and venture into the deep water. Welcome back, Lulu. Wonderful photos and a thought-provoking post today. Yes, you're so right, we need to venture (sometimes) out of our comfort zone hand-in-hand with God to protect us. When in doubt - wait. When He speaks to you, He'll make sure it is Him talking. SORRY - Pressed "Publish" before reading properly. I meant to say: When He speaks to you, He'll make sure YOU KNOW it is Him talking. Yes, His voice is unmistakable, Victor! Hi Lulu! What a fantastic photo of the waters of the Caribbean. Those blues are just so deep and gorgeous. Did you really go out to the rolling seas of the dark blue? Wow, you are a brave person...I don't know if I could. It's a great metaphor for diving in deep with God though. Can I go where it might be threatening? Will I have enough faith to dive and wait for the Lord to help me? A wonderful reflection for me in Lent. Yes, Ceil, I did venture into the depths. I love your analogy- diving in deep with God! Welcome back, my friend! Too bad we couldn't have overlapped our visit just a bit! After basking in the beauty of the islands, your words have hit home in a most special way. Thank you for going there. How long will you be in the Bahamas? Need suggestions, let me know! It is BEAUTIFUL! !